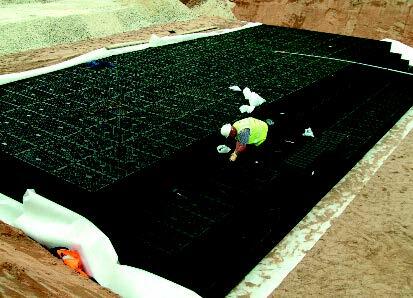 For the installation of Infiltration and Attenuation Crates JDP offer a range of permeable geotextiles and non-permeable membranes and protective fleeces (needle punched fibre geotextile), designed to complete the system. In addition to these products a supply and fit service can also be offered for large projects, particularly where a sealed attenuation tank is required. 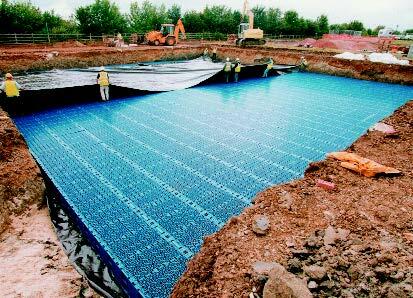 For soakaway applications we provide woven and non-woven geotextiles. These offer high permeability and strength, ideal for infiltration crates. See Road Building section for our full range of geotextiles. For storage applications we offer impermeable polyethylene membranes in a roll form along with joining tapes and top hat pipe seals to enable sealing of pipe inlet/outlet junctions with storage tank. Together with needle punched Fibre (non-woven) geotextile protection fleece to minimise risk of puncture to impermeable membrane from sharps in backfill material. If a fully welded system is required we can supply materials and labour to site. The contractor shall excavate the hole whilst our fully approved installer will install the crates, geotextile protection fleece, and impermeable membrane with fully welded seams (any membrane thickness from 0.75mm to 2mm is available) and securely welded pipe entries and vent pipes. The contractor is then left to backfill around tank. Supply and fit option - Our suppliers carry all necessary public liability insurances and CIS5 certification.